Fair warning, this post is for all my armour peeps out there. Also, please do not download and repost my photos without linking back to this blog post and attributing my name as the photographer. 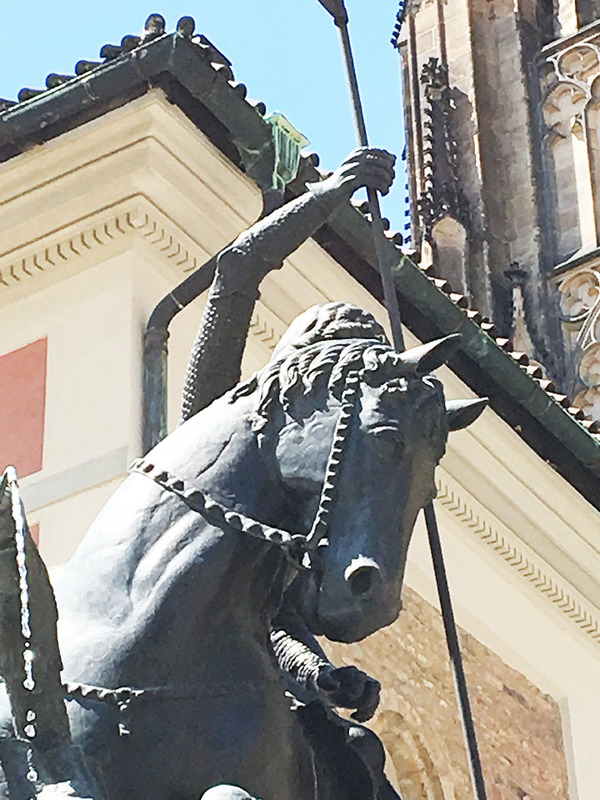 Right in the middle of the Prague Castle complex sits a faithful reproduction of a statue of St. George and the Dragon. 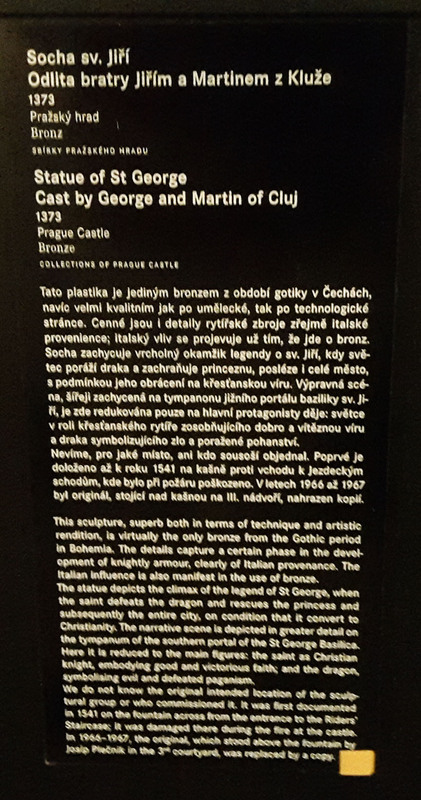 The original dates to 1373 and languishes in somewhat dim lighting inside the “Story of Prague” exhibit. Our friend Bob Charrette of La Belle Compagnie requested that we photograph it as best we could, and so I did, even taking some photos of the original version in dim lighting, though the exhibit does not allow photography. These photos are a mixed bag—when the sun was at my back, the photos came out well enough, but when the sun was in front of me, predictable trouble ensued. I’ve tried to lighten them up as much as possible to pick out detail. I was further hampered by the fact that these are iPhone pictures. I chose not to bring my good camera on this trip due to its bulk. I didn’t want to cross the line where I’m only documenting historical stuff and no longer really on vacation with my sweetheart. Have you wondered exactly how many buckles close the back of George’s corazzina? 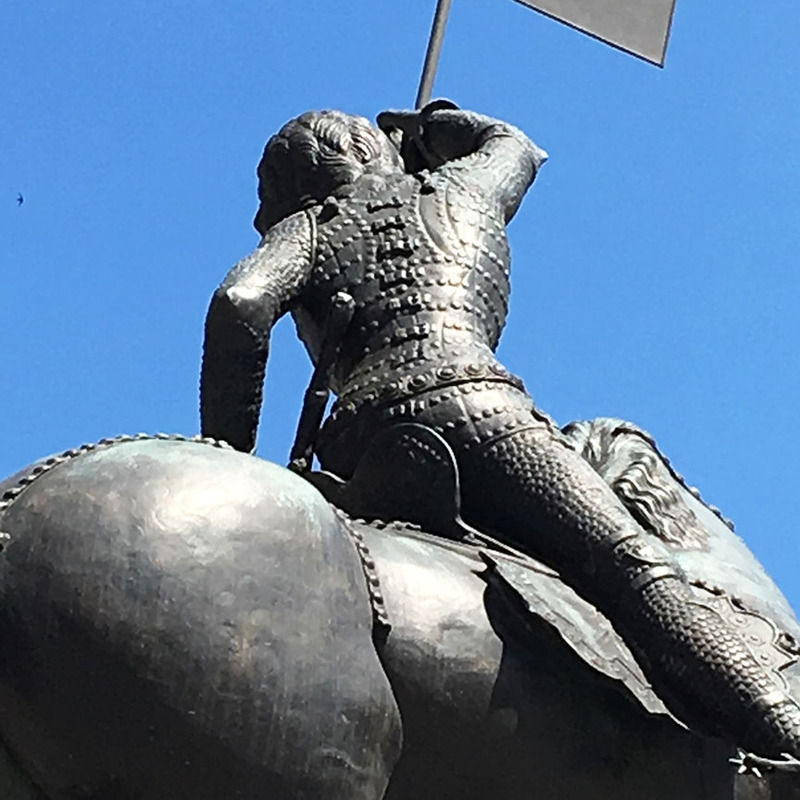 The answer could range from 9 to 10, depending on whether or not you believe there’s a buckle under the knightly belt around his hips. 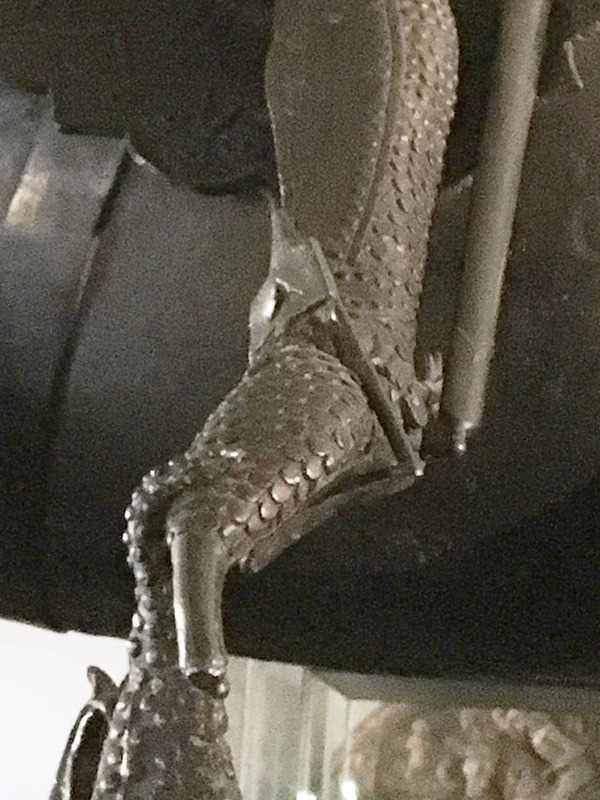 There is also another buckle at the bottom, obscured by the saddle. 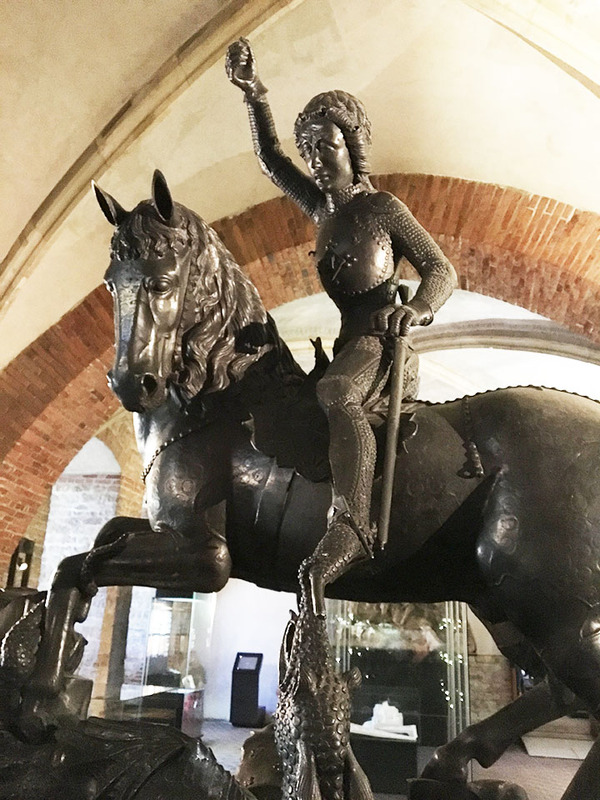 This was confirmed for me by Bertus Brokamp, who has seen another casting of this statue in the Victoria and Albert Museum in London, where it is low enough to see. A closer view of the back of George’s corazzina. Eight, nine, or ten buckles? 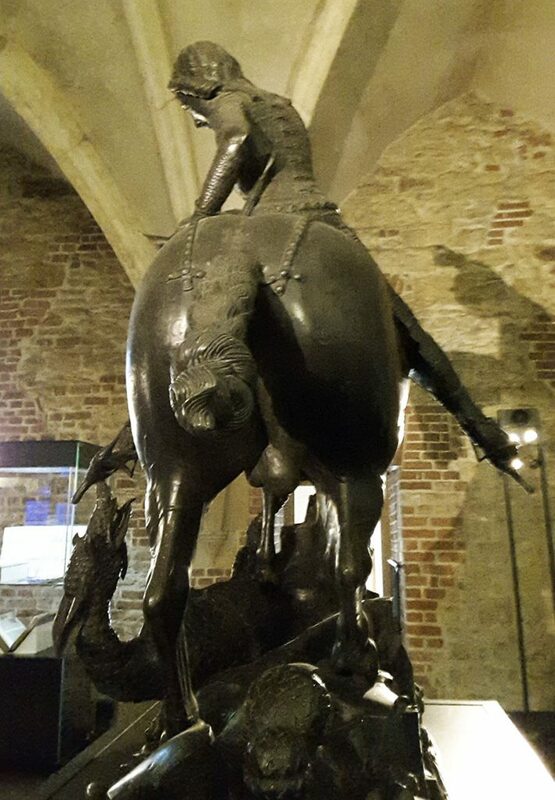 I love that this statue shows us that medieval men at arms did not sit in their saddles like we sit in chairs. They didn’t bend their knees a lot, except as necessary to twist around. They held their legs straight and braced for the most part. This position gave them the most collected body mechanics possible for the fast and brutal application of upper body strength. He might as well be standing up on his stirrups. 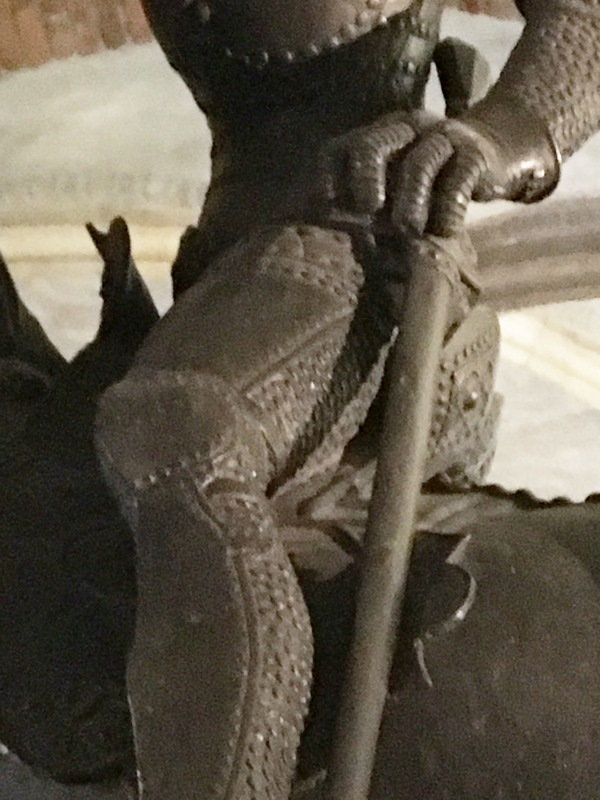 The medieval man-at-arm’s legs splayed over their horses like an inverted V.
The original statue. Note his left leg is slightly bent because he’s twisting to the left. Another view of his inverted-V leg position. Another noteworthy feature of our George is that he’s wearing nicely tailored mail from his neck down to his toes. His greaves are particularly shapely, as are the pointy-toed soles supporting his feet. Note, the mail appears as simple, overlapping, circular discs, no indents in the middle of each disc. Front view of the corazzina, tailored mail shirt, standard, and a spaulder. Such shapely legs you have! But… I don’t think you have enough lames in your gauntlet. Note the sole of the mail legs wraps up at the toes into a solid outward-angled point that mimics the most fashionable shoe shape of this time period. I think the sole was most likely water-hardened leather (cuir bouilli). Lastly, I offer some skeptical observations. 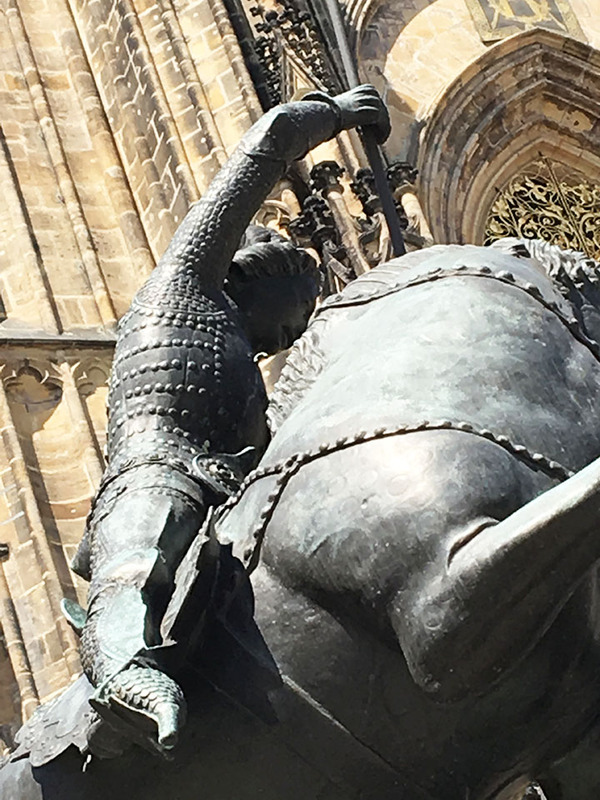 Here’s a photo of George’s long, thin arm, raised to strike down the dragon. Note his elbow cop. It’s shallow at best, preventing total coverage of the elbow when the arm is bent. The straps are so wide apart that they are going to bind the arm should it bend any more than it is already. I have to wonder if this is artistic license rather than a faithful representation of an actual elbow cop’s strapping. 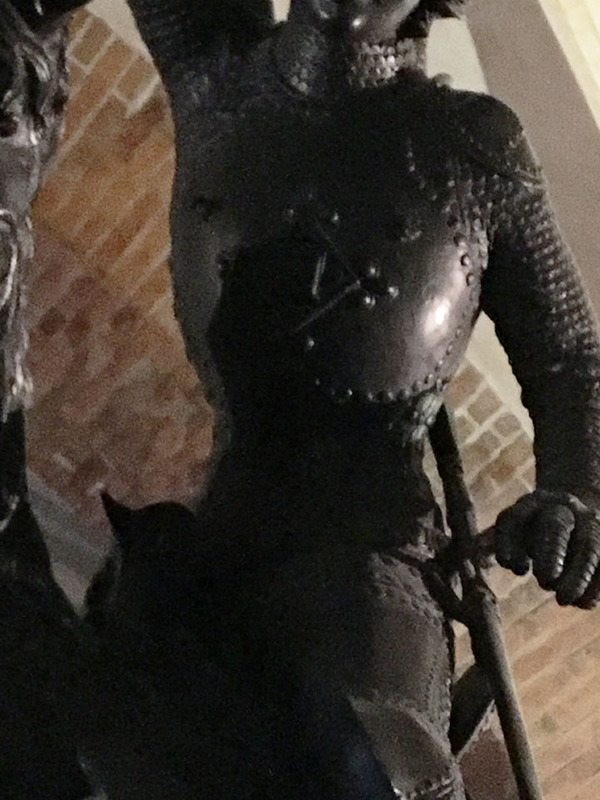 The bell on his gauntlet is narrow, even in comparison to surviving examples, like the Black Prince’s. There’s not a lot of wrist range before the flesh is fighting the metal. George’s arm. Note his elbow cop. 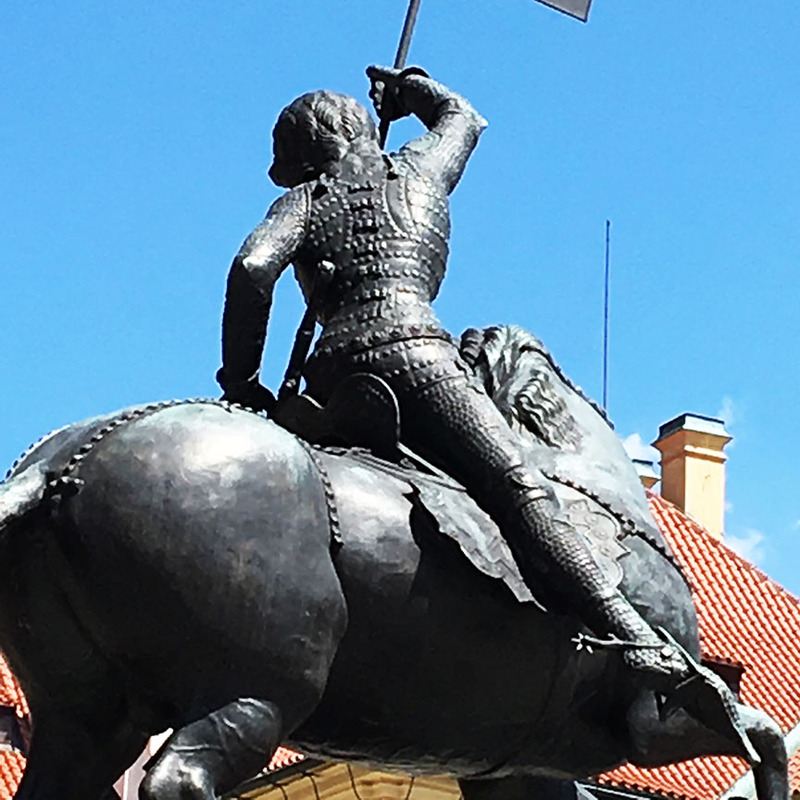 In conclusion, the cast bronze statue of St. George and the Dragon in Prague portrays an idealized example of transitional armour in later 14th century central Europe. It’s a treasure for armour historians, not least of which because it provides copious material for critical analysis. I suspect that you are correct, in that there may be a lot of Artistic License in the depiction of the armour. Tasha, did you notice, that the elbow cops seem to be made out of three pieces, with the straps linked to the two outer pieces? This might indicate a flexible construction. That’s interesting info, Holger, about the Georg and Martin of Klausenberg — thanks for sharing it. 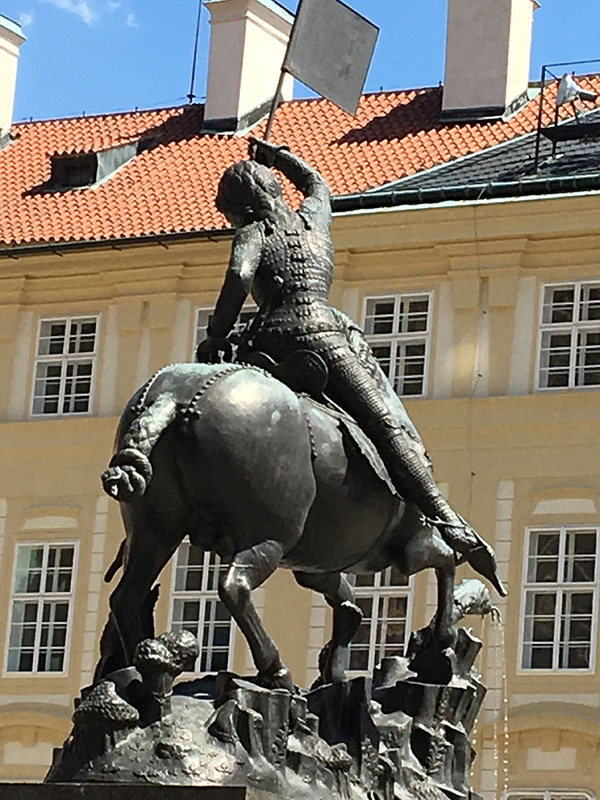 It may very well be unknown to the Prague Castle curators, or it is known, but there isn’t a budget to re-issue the informational plaque. As for the elbow, it didn’t look like 3 pieces to me at the time, but I can see the rivet pattern that might make it appear like 3 pieces after all… hard for me to say. My pictures were inexpert at best.